The Trials and Tribulations of a Twenty-First Century Troubadour in Paris. 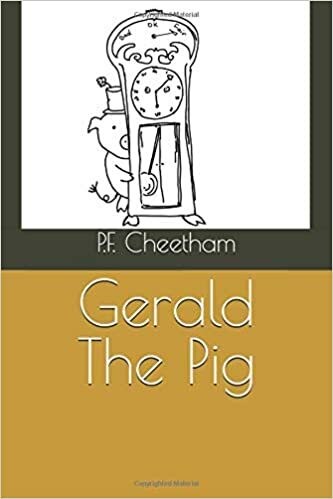 Available from Amazon along with his other books. Also available in Waterstones and all good book shops. Or order a signed copy from the Author…. He had stayed in room 6 and room 8 as well as some others in the Parisian hotel, but never in room 4 where Jim Morrison had stayed on his last visit to Paris. In this vividly personal memoir and exploration, written in the spirit of Baudelaire, Ionesco, Jean Paul Sartre, Picasso and other great writers café scribes and artists, Paul recounts his time spent in Paris cafe society and also in the haunted hotel that he and Jim Morrison had sought inspiration in. Review. Paul’s sardonic streak is never faraway as he retells his adventures and reveals the teeming underbelly of Parisian life. Review: An ironical, philosophical and psychological observation of the “human Folly” (la folie humaine) using part of the Authors life in as the microcosm of “La grande Folie”. Trials… is an autobiographical account of the author’s time spent in Parisian café society, written in diary-like format and paying homage to the great French poets and philosophers of the 19th and early 20th centuries. 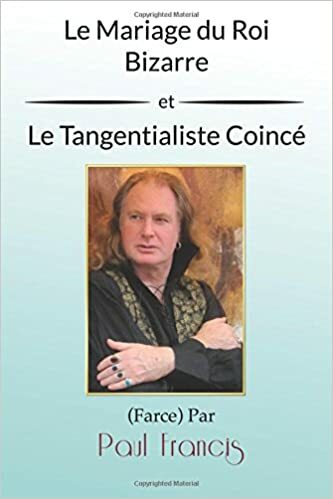 From the sample chapters, this looks to be quite a surreal trip into the author’s thoughts and experiences, from his attempts to found new religions and his colourful songwriting (his French song in Chapter 18 is quite poignant) to the horrors of a severe arm infection nearly loosing his left arm and in Chapter 19 being poisoned by his own girlfriend (who then became an ex not surprisingly). 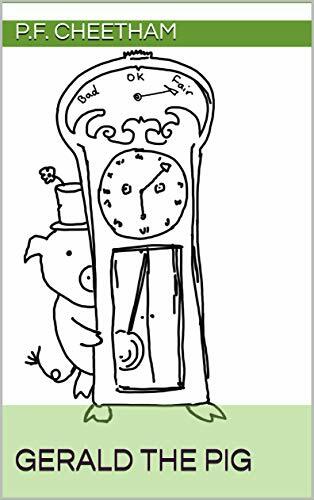 In keeping with the author’s sardonic steak, some of the scenarios provide rich veins of humour – readers may chuckle aloud at Guru Mc’Coypu’s commandment to ‘love everybody except people you don’t like’, and at Danny’s comment: ‘I had just met one of the great French thinkers. It was a pity he wasn’t French’, while Paul’s little aside after he has made love with his girlfriend on top is quite amusing: ‘Her cat came and sat on me (not in the same way)’. The remaining chapter titles, meanwhile, look promising, from the amusing-sounding ‘Mr Extremely-Friendly does his ironing’ to the visually pleasing image of ‘The hotel cat pirouettes on the wash-basin’ and the intriguing ‘Baba Papa and the girl who thought that the Chateau de Versailles was more important than me’. The autor’s prose style reflects his content: it is conversational, sometimes quite confessional, with an energy about it that is very appealing. 18 can give the work a bit of a breathless feel that may be intentional but makes it rather a strain on the eyes. Overall, the main appeal of this work appears to be its ironic, perceptive and sometimes touching observations on life and its absurdities, and the author’s own personal little forays into farce, from which he somehow still emerges as a more-or-less sane, self-aware human being. Here is an account in a great book written by Danny Wallace called “JOIN ME” of his meating with the 21st Century Troubadour in a Parisian café, this was kindly compiled by one of Space Toad’s old Bass players Captain Sensible (maybe the best….?). In Chapter 14 of The Trials and Tribulations…………………… can be seen the Author’s own intriguing account of the meeting. Death of Dionysus Ne pousez pas le Fleuve Candlelight in the Void The Coypu Conciousness Hand Book Gerald the Pig The Man who whore a tragic cloak of mystery . 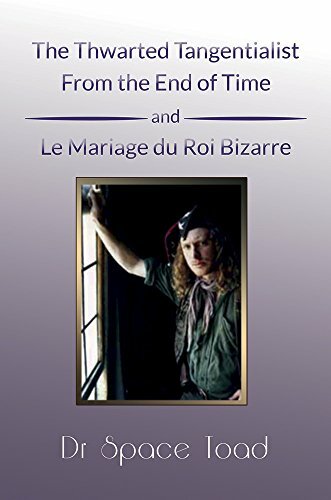 PLAYS: Le Mariage du Roi Bizare (click here to order) et Le Tangentialiste coincé (version francaise). Paper back or Kindle version. Dr Space Toad reads from his book and sings his song “My Old Mate the Coypu”.The lyrics of the song are in the book. 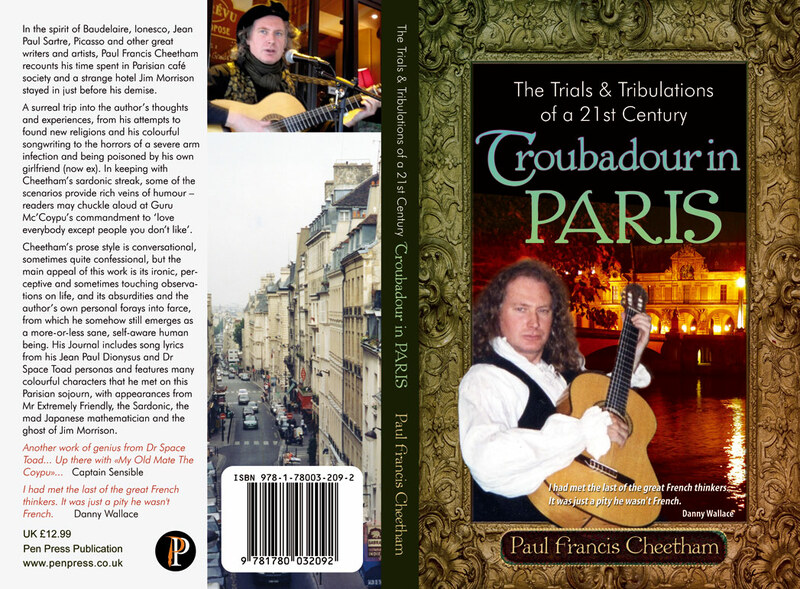 Troubadour in Paris. “Ne Poussez pas le Fleuve”. 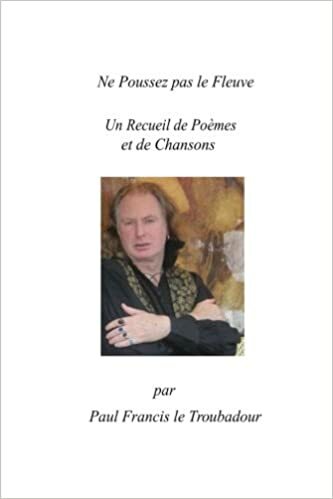 Is a collection of his poetry and lyrics in French”. To order copies please click here. . Also available in Canada. Dr Space Toad reads from his book and sings his song “My Old Mate the Coypu”.. The World is Upside Down…Space Toad sings another of his songs; the lyrics of which are also in his first Book. . Here is the English versions of his two amazing plays. The Twarted Tangentialist from the end of Time and Le Mariage du Roi Bizare. Click here to order Paper backs or Kindles. Loved the book (thanks for signing it) “The trials and tribulations of a 21st century Troubadour in Paris”. New adventures on each page in the life of Paul Francis. Introducing the reader to a host of interesting characters like Mr Guzuntide, beautiful poetry like “Butterfly”, “Special man” and “when you are in love” as well as observations such as “if music is the food of life how come you can’t eat the violins”. You don’t have to be a travelling artist to appreciate all bizarre things life can throw at you. This book is an enriching experience for all people of all walks of life. Can’t wait for the next book .